Your very own page on New Zealand's top ranking music teacher directory on Google (try searching for your instrument in your city!). Student testimonials (Featured and Professional only). No referral fees! You make all the money from your lessons - as you should! student enquiries since Jan 2013! How are the teachers ordered in the search results? The teachers are grouped into subscription plan levels and the order is randomly generated within each plan group every 4-6hours. This gives every teacher a chance of appearing higher in the results and done periodicly so that the site loads fast for users searching. Professional Plan teachers will always appear higher than teachers on lower plans. When will my plan renew? Plans renew automatically at the end of your billing cycle. Can I upgrade, downgrade or cancel my plan mid billing cycle? Yes, both Yearly and Monthly users can upgrade and downgrade at anytime and a prorata discount is offered if you change plan mid cycle. Users can cancel at anytime but will not receive a refund for any time left on their current billing cycle. If you are changing mid billing cycle you will recieve a discount up to the max value of your new plan for any unused time on your current plan. For example if you are on a monthly plan and choose to change plan right in the middle of your billing cycle you will receive 50% of you current plan value as a discount. 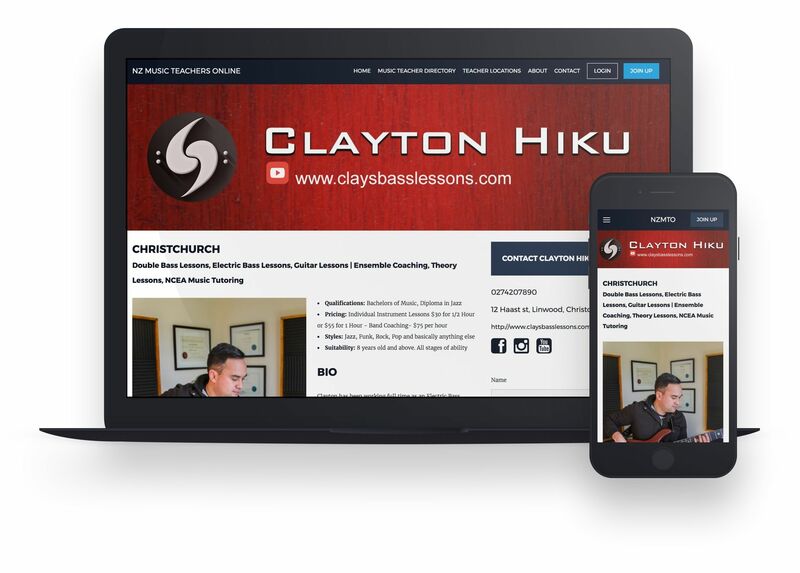 NZ Music Teachers Online is a valuable asset for every NZ music teacher that's serious about extending their multimedia profile and reaching a larger audience of new potential students. Mike's truly professional, easy to work with and very speedy when it comes to implementing new ideas to continue to keep the NZ Music Teachers Online site #1 with both students and coaches and teachers. Since joining this site I've had a lot of enquiries from prospective students. It's been well worth the price of the premium plan. I like the way it gives a photo and bio as well as the details of fees etc - makes it much more approachable for a student to be able to see the person first! NZ Music Teachers online is a great NZ site and resource. Everything you need is in one place. Not only do I get a lot of enquiries and students via NZMTO, but it is also my number one site to send people to when anyone talks to me about learning any instrument. NZ Music Teachers online makes it easy to help the right student find the right teacher - in any location. The "NZ Music Teachers Online" Website is excellent and a must have for any music teacher in NZ. It has an excellent, modern web page design and extremely fair pricing. I get many new students a year directly from the site which is worth way more than the yearly cost. Students have the ability to search and filter teachers by the instrument and location which is great and teachers have the ability to upload photos, bio, website links and embed videos too! The website is regularly being updated with new features and they take on lots of feedback from the teachers on the site for things you wish you could add to your profile too. Now with the growing facebook and instagram pages theres a good social media reach as well. Definitely the best private music education advertising site in NZ. Highly Recommended!